Total Basset Case: What's for Lunch? 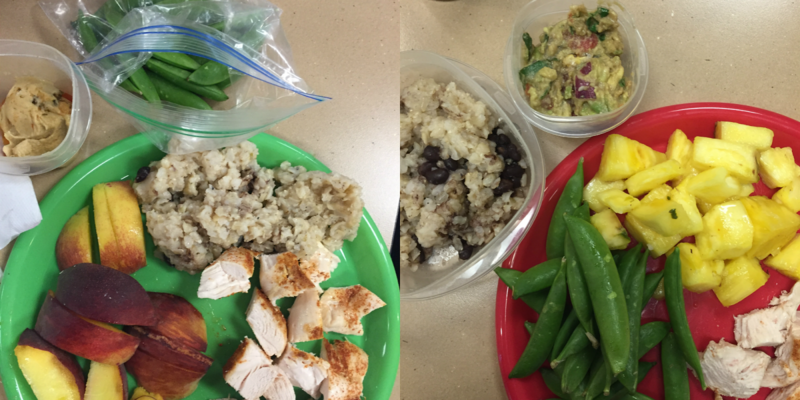 A few weeks ago when I posted about my morning efficiency routine I mentioned packing my lunch the night before. Since then, I've had a few requests about what I pack for lunch to mix things up. 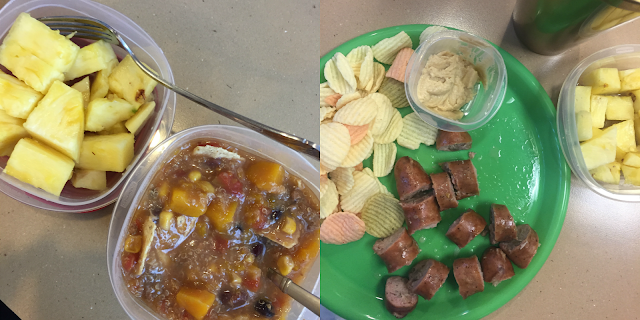 I am lucky enough to eat with a very fun group everyday and that certainly helps to make lunch time way more enjoyable. As I mentioned in my previous post, I have to have a variety of things for lunch every day. Mister is 100% content eating the same thing day in and day out but I cannot. I need variety, something to look forward to and something that I want to eat. I really love eating and if I'm not excited about it then it just isn't fun. And, to me, eating should be fun. The main protein of the majority of our lunches is chicken. Each week we buy 8-10 chicken breasts at the grocery. (The butcher has finally stopped looking at us funny when we order that many at a time.) Mister takes a whole one breast each day and I take a half. That quickly adds up to a lot of chicken but at $1.99/lb it is WAY cheaper than lunch meat and a million and a half times better for you. Then each Sunday night we bake 4-5 of those chicken breasts to start out the week. I season them different each week to switch things up. When I am not feeling chicken I will take leftovers from the night before a a couple of chicken sausages we pick up from Costco. I keep a few plastic plates at my desk to carry to the lunch room and also carry my own knife and fork with me to work. This is way easier than trying to use plastic cutlery and jazzes up my meal just a little. So as you can see, I try to have as much variety as I can. Other meal favorites include: apples, roasted broccoli, quinoa, carrots, salads, tortilla chips and the list goes on. I actually quite enjoy taking my lunch and it helps that my whole lunch table also packs. We do occasionally go out for lunch but my wallet nor my waist can do that very often. Any questions or suggestions for me to pack? 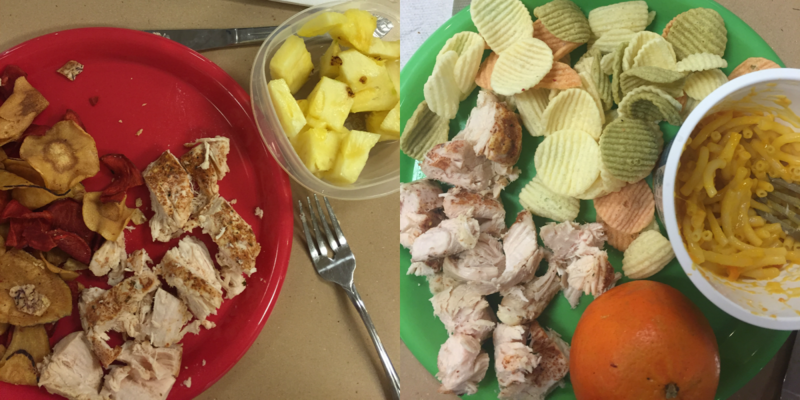 I weirdly love seeing what other people bring to lunch each day haha- so I'm glad you shared this! I'm like you, I need variety in my lunches or I get bored and Jared is good with eating the same few things every single day! I need to get better about planning my lunches. Being at home it's easy to be like...oh I'll just eat whatever! But it turns into having snacks here and there without ever eating a meal! Good for you, lady - this all looks yummy and healthy. Smart on the plates/utensils too. I should take a cue from this, as one who has access to her entire kitchen for lunch time but doesn't eat nearly this well!! Cooking up a bunch of chicken ahead of time is such a good idea - I'd probably do salads as well when it gets to be time for good produce, otherwise I love it mixed with sauteed peppers/onions and one of those little guacamole packs. The Aidell's chicken sausage is really good that way too! Ooh or have you tried my favorite broccoli salad recipe (http://motherrimmy.com/thai-chopped-broccoli-salad-recipe-with-peanuts-sauce/)? It's crazy good and just gets better with age in the fridge... I bet that would be nice for lunch mixed with your chicken! Thanks for sharing! I have recently started cooking chicken in advance, although I use it for dinner mostly not lunch. I really need to get creative with my lunches. I eat a pb&j basically every meal.